Born in 1991 in Vasto, Davide Di Ienno began studying guitar with the guitarist Marco Salcito. In October 2010, he graduated from the Conservatory “D. Cimarosa” of Avellino, and in 2013 he earned his second degree from the Conservatory “L. Perosi” of Campobasso, with the highest honors. 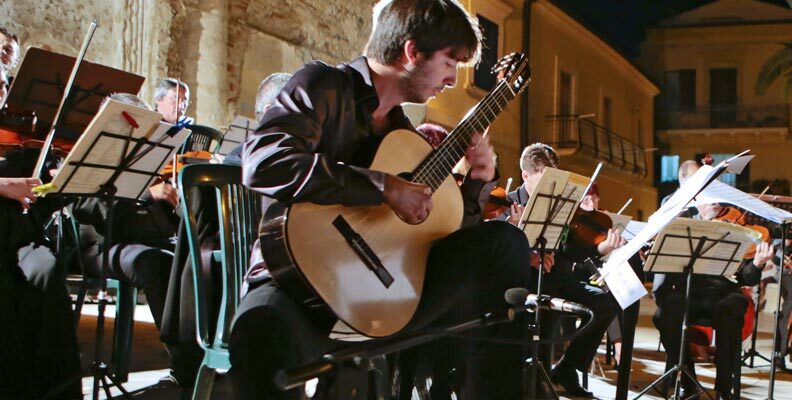 He studied with Maestro Aniello Desiderio at the Music Academy of Gorizia and at the Koblenz International Guitar Academy (Germany), from where he graduated with the maximum score and honors. He attended master classes with distinguished Maestros such as Oscar Ghiglia, Lorenzo Micheli, Giulio Tampalini, Marcin Dylla, Goran Krivokapic, Shin-Ichi Fukuda, Timo Korhonen, John Dearman, Costas Cotsiolis, Hubert Kappel, Zoran Dukic, and Judicael Perroy. He recorded the piece “Tarbaby” for the canadian music publisher “Les Productions d’OZ”. The piece has been composed by the musician Giorgio Tortora and comes from the album “American Friends”. In 2015, Davide Di Ienno recorded his first CD published by “Tactus”; it consists in a monografic opera based on Maestro Raffaele Bellafronte’s guitar works. He has performed as a solo the “Concierto de Aranjuez” at the Rhein-Mosel-Halle in Koblenz (Germany), with the Staatsorchester Rheinische Philharmonie Orchestra, directed by Maestro Garrett Keast and two more concerts in Italy, accompained by The Philharmonic Orchestra Oltenia Craiova, from Romania. He gained concert experiences both in Italy and abroad. He performed at some French international festivals such as “Suona Italiano”, “Provence Festival” and “Festival of Marseille”, in significant cities like Salzburg and Wien (Austria), in Koblenz (Germany) and in Malta (Bir Miftuh International Music Festival). He had the honour to receive the Marseilles’ city medal for having performed a concert during the year 2013, in which Marseille has been named as the Capital of the European Culture. In 2016, he performed as a solo – in world premiere – the “Suite n. 2” composed for guitar, bassoon and string orchestra by the contemporary musician Raffaele Bellafronte. Davide Di Ienno brought the “Suite No. 2” in a tour with the piano player Patrick De Ritis and the Wiener Concert-Verein Orchestra, directed by Maestro Ulf Schirmer. They performed together in important theaters such as the Renzo Piano’s “Auditorium” in L’Aquila, the “Teatro Savoia” in Campobasso, the “Teatro Vittoria” in Rome, the “Teatro di Corte di Palazzo Reale” in Naples, the “Sala Verdi” in Milan, the “Teatro Sociale” in Sondrio (Lombardia), and the “Brahms-Saal Musikverein” in Wien. Davide Di Ienno has won several national and international competitions and since 2009 he has been teaching at the Civic School of Music in Vasto.